From its latest top spot on a travel listicle to its conflicted legacy as the capital of the Confederacy to its RVA re-branding, Richmond, Virginia is a city full of narratives, many of which are contested. Richmond has been burned, rebuilt, desegregated, and re-segregated. It is the capital of a state that is sometimes red and sometimes blue. It is a city of neighborhoods, each with their own strong and evolving identities. It is home to a thriving food scene and the most renowned public arts university in the country (and growing), but it is also a place with extreme poverty impacting the lives of over a quarter of its over 200,000 residents. A recent Washington Post feature highlights a handful of these contested grounds while singing our praises, but I still find myself explaining to out-of-towners where these 10,000 feet-tall narratives fall short. They miss the shades of gray, the nuance which animates the movers and shakers of RVA, revealing itself in a demographic diversity beyond the Black-White binary, competing voices in “hip” (read: gentrifying) neighborhoods, and an anti-Confederate but proudly Southern identity. It is in these quirkier, smaller narratives that I can more clearly identify the place that I call home. Even as a lifelong Richmonder (greater RVA, that is—I did grow up in suburbia), I struggle to name what it is that makes Richmond so…Richmond, but I know it when I hear it. Fortunately, I hear these kinds of narratives regularly at storytelling events hosted by Secretly Y’all. Taking place on Monday evenings every other month, Secretly Y’all events are each organized around a theme. Storytellers are given 7 minutes to speak their truth, before being politely-but-firmly encouraged to wrap up by a chiming bell. The first half features a set list of four to six storytellers, and the second half is an open mic during which self-scribbled names are pulled out of a hat to share. I submitted a story for the first Secretly Y’all event I ever attended. I imagined myself telling a deeply personal story to a group of about 20 recent UR and VCU grads in a coffee shop-type setting. A few weeks later, I found myself staring into a 100+ person crowd packed into the back of a dimly-lit, stylish lounge (Balliceaux, where most Secretly Y’all events take place), full of faces young and old, familiar and unfamiliar, laughing over craft cocktails, all facing towards a cleared area that normally hosts a live band. They even had sound equipment to turn my nerves-ridden story into a permanent part of their podcast. As I stared out into the dimly lit room, the chatter faded and the clinking glasses settled. I cleared my throat. Who knew that so many other Richmonders would care about stories as much as I did? Brady and King, a humorous duo of Virginia natives with no formal background in storytelling, are quick to poke fun at each other and their growing success. What they will tell you is that they are proud of the different Richmonds with which they have built community along their way. At their “Through the Wringer” event, stories included a Polish immigrant’s thriller tale of a near-fatal head injury, a public radio DJ’s time of homelessness, a gentleman’s eye-witness account of domestic violence, a recently-divorced and Venezuelan-born mother’s story of moving from Miami to Richmond, and (on the humorous side) a professor’s struggle to find an apartment in Portland, Oregon. 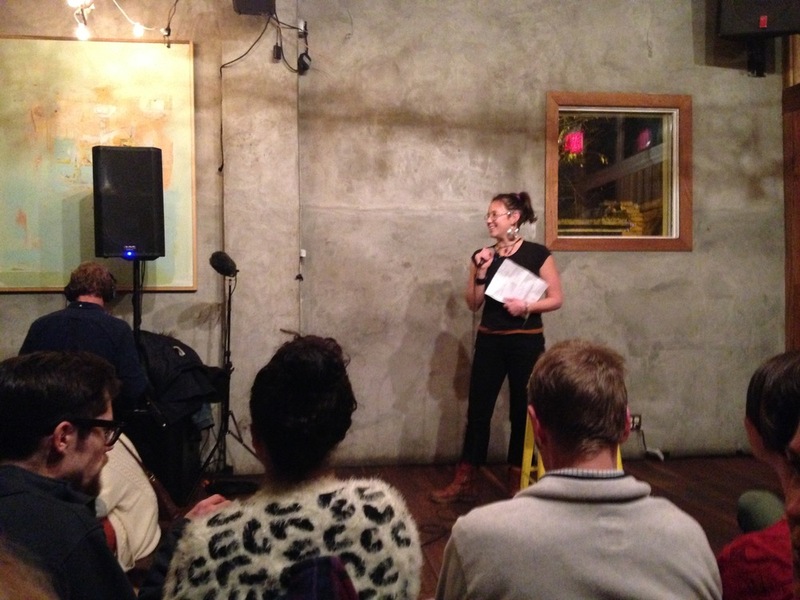 Some storytellers were warmly-welcomed regulars, while others were holding the microphone for the first time. Though Brady and King are light-heartedly humble, the success of Secretly Y’all speaks for itself in high-profile collaborations such as a story-share by Virginia Holocaust Museum co-founder Jay Ipson, four events at the Virginia Museum of Fine Arts, and their Bicycle Y’all festival sponsored by New Belgium Brewing. For me, Secretly Y’all fills gaps in between Richmond’s larger narratives. As the city grows and evolves, I am comforted by the fact that there is a designated place for Richmonders to make their own contributions to the city’s stories—a StoryCorps just for RVA, democratically documenting little pieces of a contested narrative in flux. And it is purposefully not a StoryCorps or Moth event. Brady and King appreciate the creative independence and distinctly (but accidentally) Southern identity of Secretly Y’all—a name handed down by a friend and former co-organizer. Continuing their collaborations, their next event will take place on March 21 and is co-sponsored by Death Club Radio around the theme, “The Sick, the Dead, and the Dying.” Promising hard-hitting, existential tales (perhaps with a hint of Southern Gothic flair), the event is sure to be another powerful night of storytelling. I have no doubt that, as I hear another round of Richmonders’ tales, I will feel a comforting familiarity at the same time that I add a new layer of nuance to my hometown. I’m throwing my name in the hat for this one, nervous and excited to share a piece of my Richmond with friends and strangers. I hope y’all will join me.